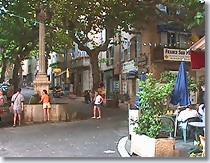 Follow signs for Draguignan on the D562, take D225 to Callas, then take D425. 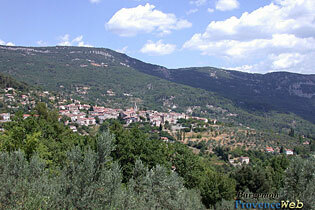 Nestled in the middle of olive groves, at 500m. 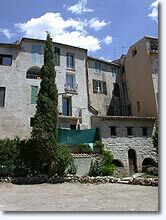 altitude, Bargemon is a picturesque medieval village close to the lakes of Sainte Croix and Saint Cassien, and the Verdon canyons. 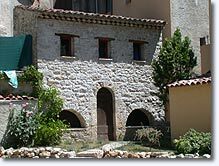 Bargemon is the choice retreat for rnany famous scientists, alchemists, poets and artists, and offers the pilgrims of Notre Dame de Montaigu many different chapels to visit and its rich history to discover..
Strolling through the old village one is charmed by the narrow streets and the little village squares each boasting its own fountain with water as pure as can be found in France. The tourist office will organize visits ot the castle, the ramparts and the 12th and 16thc. doors. The tours are given by the friendly and enthusiastic guide, Marlene. 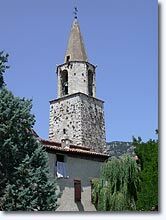 St. Etienne Church.Notre Dame de Montaigu Church. 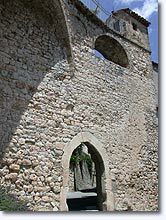 The ramparts, the Reclos castle. 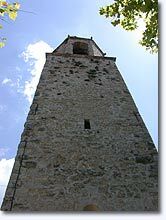 The Sarrasin tower. Fountains, the prison (1582), the museum-galery Honore Camos. Callas (6 km), Seillans (11 km), Montferrat (10 km) and Claviers (5 km).